Two days ago a co-worker asked me “What is redemptive about sports?” Could I be so lucky? I thought this was the kind of question I only asked myself so that I could rant about it! Well, I couldn’t pass up the opportunity to delve into this delicious subject. I just had to blog about it. As providence would have it, the asking of this question coincided exactly with the retirement of a football player who almost perfectly exemplifies why this question needs asking and answering: Randy Moss. Randy Moss has been an example of the most captivating displays sports has to offer and the most disgusting (just ask Joe Buck). He was one of the most exciting, spectacular athletes ever to play football, but also one of the least likeable. And it is that last sentence that sums up why the redemptiveness of sports needs to be explained. We know our athletes. We know them too well (or at least their public personas). The problem is that we confuse the athlete for the sport. Music, sculpture, dance, poetry, painting, and other forms of art have elements of redemptive beauty and reflections of God’s glory pouring out of them. We are able to engage with them directly and personally. Mostly, we care little for the artist and deeply for the art. Sports are not like this. 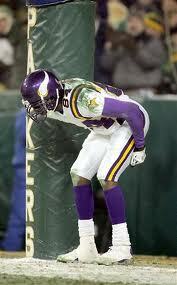 Randy Moss exhibited no less reflection of God’s glory and creative majesty than any artist. He was spectacular at his craft, gifted almost beyond belief. He did things regularly that no other player in the NFL has ever done even occasionally. And God made him to do so! But by all accounts Randy was a jerk. And so are numerous other athletes. And we, as fans viewers allow that to taint the beauty of the sport itself, the magnificence of supreme athletic feats. God made these athletes to reflect Him in their sports. God made us to see his magnificence reflected in their abilities and accomplishments. When a player like Randy Moss squirts a referee with a water bottle or when LeBron James decides he will self-promote his talents to South Beach that is disgusting. But we cannot, we must not, allow it to deflect our eyes from seeing the majesty of God in their performance at their respective crafts. Their intention of self-glorification does not change their display of God-given abilities. So what is redemptive about sports? At its most basic, the answer is the reflection of God’s glory through created beings doing things in a truly spectacular fashion. Through sports we can see aspects of God’s amazingness that can’t be found anywhere else. There is also an avenue for fellowship in rooting and enjoying, common interest, and genuine pleasure in participation. There is an opportunity to use the gifts God has given us, be they limited (like my basketball skills) or supreme. There are opportunities for relationships and ministry in unique fashions. Sports are redemptive; just don’t let the athletes get your way.